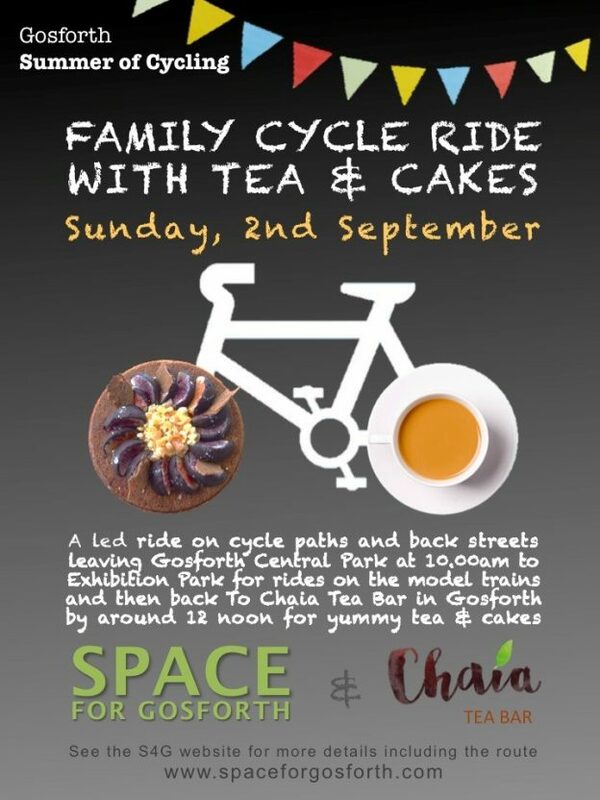 SPACE for Gosforth and Chaia Tea Bar have got together again to re-create the family bike ride we did last year. Chaia have had lots of people saying they thoroughly enjoyed it and asking for us to do it again. What could be better than a relaxed ride followed by cake! We’ll be taking a slow ride to Exhibition Park, stopping off at the trains, back through the streets of Gosforth and ending up at the rather wonderful Chaia Tea Bar who have promised a special treat for the kids. We are meeting at Gosforth Central Park War Memorial and the ride shouldn’t take much more than an hour or so. It’s not a race and there will be no rush! We’d like to keep everyone together. We should be all done by midday. All ages and abilities welcome, we’ll be on quiet streets all the way there and back. We’re deliberately zig zagging around some streets as it’s not often that a group get to cycle around in relative safety, and we’re fortunate to have some lovely tree lined streets in Gosforth. Please note that our ride won’t be on closed roads and there won’t be Marshals – riders take part at their own risk and children under 16 must be accompanied by a parent or guardian. However, there’s lots of safety just in numbers and we’ll give everyone an idea of what to expect with a few tips on staying safe before we head off. We have registered our ride as a “Ride Social” on British Cycling’s Let’s Ride page – click here for the link to the “Ride Social” Terms and Conditions. It would be great if you could register on the ride to give us an idea of numbers. Thank you so much for a wonderful morning cycling to Exhibition Park and for the delicious cake at Chaia. My three children loved the miniature railway, thank you to the train enthusiasts in the park. And finally a very big thank you to the organisers of today’s event; thank you for helping my children up when they had minor scuffles on their bikes, and thank you for all your patience and for being so friendly and welcoming. It was a great experience today, and has inspired us to cycle more.